KINGSFORD – A combination of Iron Mountain errors and Kingsford’s timely hitting propelled the Flivvers to a 12-4 win on Friday. Kingsford collected eight hits, but five errors in the first inning alone doomed Iron Mountain. Murdock said despite Iron Mountain’s mistakes, the Flivvers were able to make solid contact with the ball. 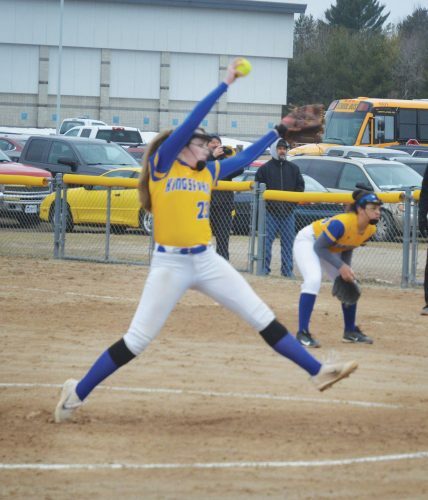 Maggie Strehlow earned the win for Kingsford, pitching a complete game giving up four runs on nine hits with a walk and three strikeouts. Paige Fortner was tagged with the loss, giving up the 12 runs (seven earned) on eight hits with nine walks and a strikeout. Emily Curtis, Katy Hicks and Sydney Wickman each had two hits for the Flivvers. Curtis had four RBIs. Wickman and Hicks both had two RBIs. Abbie Meneguzzo had an RBI. Emma Thomann’s two-run homerun in the fourth inning brought Iron Mountain to a 6-4 deficit. The Flivvers responded with three runs in the next half-inning, along with two in the fifth and another run in the sixth. Kingsford has been hitting the ball well all season, Murdock said. Kingsford hosts Escanaba on Tuesday. Iron Mountain plays at Norway on Monday. Saylor Swartout, Tori Kowalkowski (3), Sydney Wickman (3), Maggie Strehlow (2), Emily Curtis, Sabrina Wickman (3). Stoner, Tori Kowalkowski (2), Mikayla Ray, Molly Wahoviak, Katy Hicks, Maggie Strehlow, Emily Curtis, Sabrina Wickman, Abby Meneguzzo. NORWAY — Alli Sheski socked a second-game grand slam homer and Norway swept Florence in non-conference softball Friday at Marion Park. The Knights rolled 17-2 and 19-4. In the opener, Knights pitcher Mariah Gyselinck allowed one hit with six strikeouts and no walks. Norway (9-7) struck for seven runs in the first inning and six in the second. Knights’ Britta Grayvold tripled and doubled. Jordan Kraemer, Sheski and Ada VanHolla also doubled. Sheski’s grand slam came in an eight-run first inning. Norway pitchers Kelsey Carlson, Katelyn Hosking and Gyselinck gave up four hits, struck out two and walked seven. Kraemer collected a pair of doubles while VanHolla, Grayvold, Holly Mattia and Karli Stanchina each had one. The Knights host Iron Mountain on Monday. The Bobcats entertain Three Lakes on Tuesday. 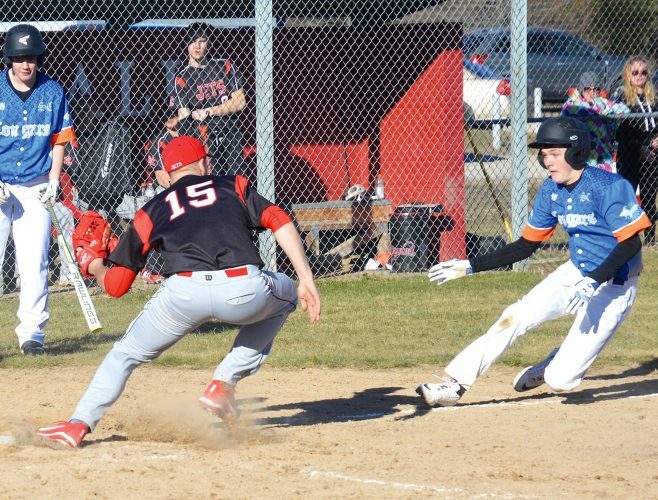 NIAGARA, Wis. — Niagara threatened in the sixth inning but Peshtigo pulled away with a five-run seventh for a 9-3 M&O Conference softball win Friday at Riverside Park. The Bulldogs held a 4-0 lead until the Badgers (4-6, 3-4) scored three runs in the bottom of the sixth inning. Badgers’ Sydney Loukus walked and Peyton Aderman singled to set up Taylor Tushoski for a two-run double in the sixth inning. Tushoski later scored on a groundout. Tushoski had two of the Badgers’ four hits in the game. Aderman and Sarah Nawn had the other two. Niagara freshman pitcher Jayden Payette permitted 10 hits, struck out two and walked two. The Badgers visit Gillett-Suring on Monday and host Oneida Nation on Thursday in a doubleheader.